106 Commerce Street, Suite 105 Lake Mary, FL 32746 TEL: 407.878.7606 • FAX: 407.878.7611 Order additional copies at GuidelineCentral.com Copyright © 2019 All rights reserved ATSMAL1913a Disclaimer is pocket guide attempts to define principles of practice that should produce high-quality patient care. It is applicable to specialists, primary care, and providers at all levels. is pocket guide should not be considered exclusive of other methods of care reasonably directed at obtaining the same results. e ultimate judgment concerning the propriety of any course of conduct must be made by the clinician aer consideration of each individual patient situation. Neither IGC, the medical associations, nor the authors endorse any product or service associated with the distributor of this clinical reference tool. 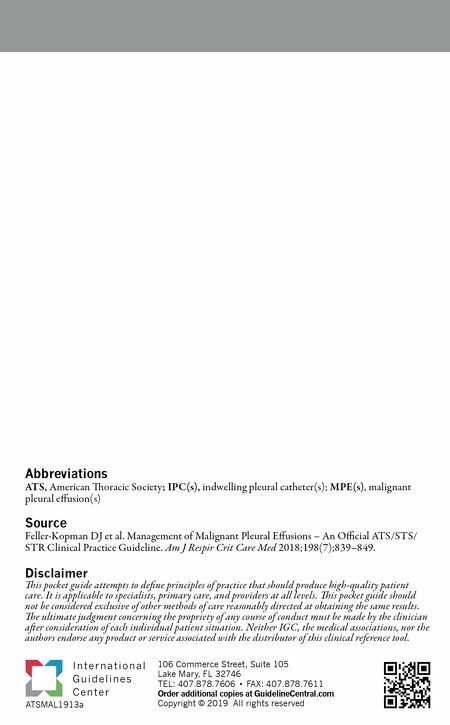 Abbreviations ATS, American oracic Society; IPC(s), indwelling pleural catheter(s); MPE(s), malignant pleural effusion(s) Source Feller-Kopman DJ et al. Management of Malignant Pleural Effusions – An Official ATS/STS/ STR Clinical Practice Guideline. Am J Respir Crit Care Med 2018;198(7);839–849.